Borage is a herb, the leaves and delightful blue, occasionally white, flowers of which impart a mild cucumber flavour. A staple of the Victorian kitchen garden, borage remains a popular choice for allotmenteers. 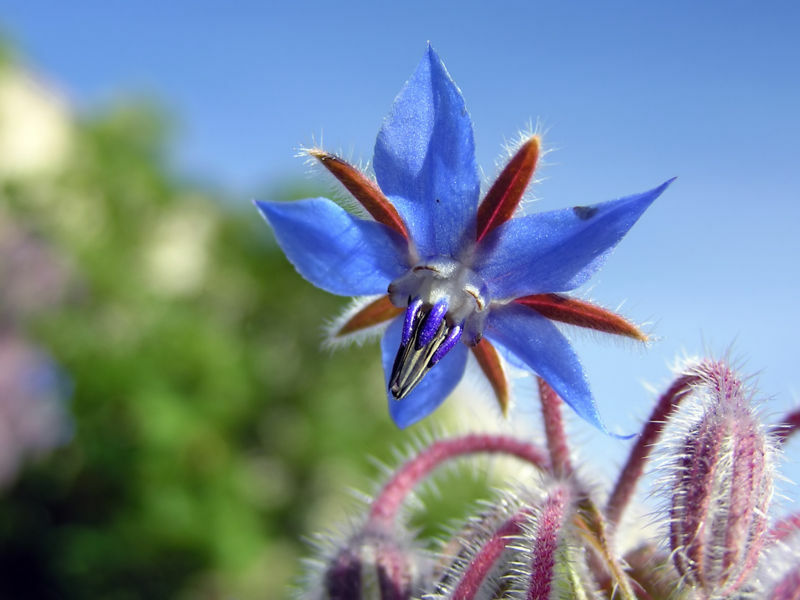 Notably, borage draws pollinating insects to its profusion of flowers and is therefore considered highly bee friendly and a useful companion plant for those fruits, vegetables and herbs requiring pollination. A secondary and less remarked advantage of borage is its vigour; borage is excellent in marginal areas, can provide a pretty and economical means of keeping weeds at bay and soon fills a dull or neglected site with foliage over three feet (approx. 100cm) in height. In temperate regions, borage can be sown once daytime temperatures are routinely in the mid-teens and frosts have abated. Sowing should be ‘direct’; that is to say, in situ rather than in pots for later transplantation. In southern England, borage can be sown from late March, though weather forecasts should be checked thoroughly before taking the plunge. Do not cleave too tightly to the packet sowing instructions. If you are gardening further north in the UK, Europe or N. America, know of inclement weather in the forecast, garden in a frost pocket, at high altitude or on heavy clay soil, sowings should be delayed to later in the spring. Equally, whilst full sun is recommended for ideal growth, this really is a plant that will tolerate less than perfect conditions. Do not hesitate to site your sowings in semi-shaded areas or on poor or less fertile ground. Flower production will likely be somewhat lessened but should remain sufficient for a pleasing display and any culinary requirements you may have. Indeed, just a few flowers in a glass of Pimms will suffice for preparation of the classic summer drink. In my case, I have used dense plantings of borage on newly tilled ground for a season, significantly weakening residual perennial weeds, which were starved of light by the dense growth. I have also enjoyed success with borage on the site of an old pebble road in a semi-shaded zone where previously only weeds found purchase on the soil’s feeble fertility. Germination should occur within two to three weeks, the relatively large, rounded cotyledon (or seed) leaves being quickly superseded by the distinctive serrated-edged ‘true leaves’ of borage. Until establishment no harvesting should take place. Encourage growth after germination through regular hand-weeding and watering as necessary. Within six to eight weeks, harvesting of the foliage can begin. Be sure to select young and tender leaves and flowers for your salads and summer drinks. Older leaves, which gradually develop a darker hue, are prickly to touch, being covered with a downy fuzz of hairs. Eventually, flower production will decline as the borage gives its energies to seeding. Collect the abundant seed in late summer and you will have this handy herb available at no cost for future sowings. There can be few vegetables so fundamentally satisfying to grow as the pumpkin. A native of North America, the aggressiveness of its growth habit and the sheer size of the resulting fruit is a wonder to behold. 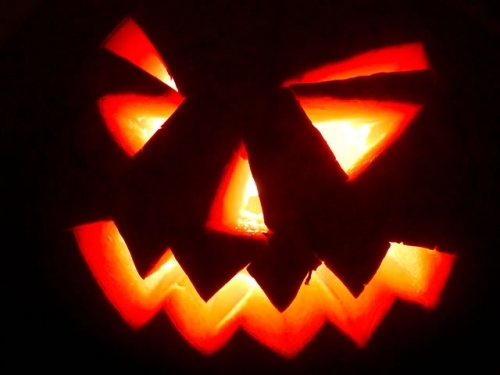 As a member of the cucurbitaceae, its familiars include the squash and marrow. Before the advent of the modern age, pumpkin was essentially unknown to Europeans, though it has since been incorporated into regional cuisines from Styria to Illinois. From the perspective of the grower, the defining feature of the pumpkin is that it is non-hardy. This means that the pumpkin cannot withstand frosts and struggles as temperatures approach the frost-threshold of approximately +4°C. In the UK, even at southern latitudes, this dictates a growing season beginning in June, with harvest being made in September. In order to gain a head start, consider sowing under cover (glass or plastic will do fine) in May and gradually acclimatise the developing seedlings to outdoor conditions once all possibility of frost has passed. For more northerly areas and frost pockets, it may be necessary to keep the developing plants under cover for all but the warmest part of the summer. Beyond an intolerance to cold conditions, your pumpkins, including those grown primarily for flavour rather than size, will exhibit a vigorous growth habit. Logically therefore, they will require a rich growing medium. In my case, I indulge the seedlings by digging trenches as deep as the sub-soil and approximately 100cm in breadth, into which I spade a mixture of manure and compost. Although manure is inappropriate in its raw state for many vegetables, being overly acidic, the pumpkin will thrive in these rich conditions. Many growers, having dug their ‘pumpkin pit’, build a robust wall around each pit before planting the pumpkin seedling. This allows for effective watering and feeding of these greedy plants, without the wasteful run-off that might otherwise result. Your pumpkin will be prey to relatively few pests and diseases, though mildew can be a difficulty later in the season, particularly in wet years. Keep an anti-fungal agent to hand and water on at the first sign of infection. By the same token, raise the developing fruits from the ground on a piece of slate or similarly flattish stone in order to avoid rots spreading from the soil. Harvest your pumpkin during September, before the first of the autumn frosts. Whether hollowing out for a Hallowe’en lantern or simply for the pleasure of pumpkin pie, you’ll be sure to appreciate the effort you gave to growing this king amongst vegetables. Salsify (Tragopogon porrifolius) is a biennial plant and member of the aster family. Usually grown as an annual for its tapering, oyster-flavoured root, it is a close relation of the perennial scorzonera. A deep, friable soil is essential, not least because salsify has a pronounced tendency to fork. As freshly manured ground will encourage forking, bed preparation should focus on removing stones and thoroughly breaking up compacted earth. Salsify requires a lengthy growing season and seeds should be sown in drills 1cm deep from late April. In colder regions, consider cloche protection for the tender seedlings, especially if inclement weather is forecast. The distance between drills should be 30cm, with thinning allowing for final spacings of 20-30cm between plants. This is not a demanding plant to grow. Weed carefully and avoiding nicking the developing tap root when using a hoe. 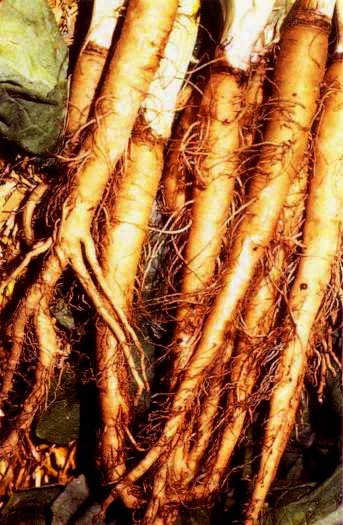 The narrow root, with parsnip-coloured skin punctuated by smaller off-shoots, will grow to 25cm in length. As with the parsnip, flavour is said to improve with the advent of the autumn frosts, which are your cue to begin harvesting. To the uninitiated, late summer is the peak of the vegetable growing year. Indeed, the months of July to September are those in which the greatest weight of vegetables will be harvested. For a moment though, consider the slowing growth of weeds and wild-flowers. As little-by-little day gives up more to night, so on an intimate molecular level your crops are adjusting to the changing seasons. The great arc of the annual calendar, in turning to make its slow progress into autumn, will now drive the bulk of your vegetables to fatten root, tuber, fruit and seed. For many growers, snow-covered vegetable beds, bare of all save a few hardy outliers (delicious, frost-sweetened parsnip, say, or crisp deep-green kale) will come as a somewhat premature, not to say rather depressing thought. In fact, now is an excellent time to plan for the planting of beds vacated by summer-season staples. Two culinary essentials will likely feature in your autumn planning: garlic and onion. Over-wintering garlic comes in several varieties and is available to order from August. Try ‘softneck‘ types such as Jolimon or Solent Wight or ‘hardneck‘ types, for example the purple-striped Vayo and Illico varieties. Note that hardneck types may not be braided for storage so easily as softnecks but are, by repute, more flavoursome. If space is not at issue, consider growing several varieties at once. Over-wintering onions are a triumph of selective breeding and are bought as sets. It is advisable to buy heat-treated varieties, in which the embryonic flower has been killed, as this will eliminate the risk of bolting. Again, there are several varieties to choose; white, yellow and red types all being available. For me, the outstanding wintering variety is Senshu Yellow, a reliable and heavy cropper, which is widely available from commercial growers. Even if planning for autumn plantings in the heat of summer seems bizarre, at least take the time to enjoy the many special autumn / winter seed catalogues now being issued by the major seed merchants. These should demonstrate the possibilities of growing throughout the coming months, inspiring you to see even the depths of winter as an opportunity to maintain a productive plot. To grow the deep purple, occasionally golden globes of the beetroot (Beta vulgaris) is an especial pleasure. With planning, namely successional monthly sowing and the pickling of surplus produce, the beetroot may be enjoyed year round. As with most root vegetables, beetroot prefers a friable, light soil, free from stones and other impediments to root expansion. Do not manure immediately prior to sowing, better rather to incorporate lots of well-rotted compost into the bed, ideally in the preceding autumn. A little garden lime can be added if your soil pH is particularly acidic. A note about container growing; although the common globe beetroots are neither as long nor as deeply rooted as the carrot or parsnip, they will produce a tap root of sorts and this must be comfortably accommodated. Although so-called ‘monogerm’ varieties do exist, seeds are traditionally sold in clusters. These can be sown directly outside in short drills from March onwards in southern England. For more northerly climbs, high altitudes and frost pockets, sowing times will be later, the optimum period for sowing in most climates being May. Germination rates will significantly decline in cold, heavy or rain-saturated ground. Allow 10cm between seeds, which should be sown in drills 25cm apart, the depth of planting being no more than 2-3cm. For early sowings, protect the emerging seedlings with cloches. The seedlings should be thinned once two or more true leaves have developed, these thinnings may be added to early-season salads. Aside from the occasional scattering of organic slug pellets and careful hoeing to restrain weed growth, your beetroot should be ready for harvesting within 12 weeks. The radish Raphanus sativus, is a quick-growing, edible root. Prepare a bed, incorporating well-rotted compost and finish to a fine tilth. A light loam, with a neutral pH should be your aim. Sow no more than 1-2cm deep. Dense plantings will produce inadequate, ‘spindly’ roots that fail to swell, so congestion should be avoided. It is best to sow seeds thinly, 3cm apart, and in rows at intervals of 15cm. If thinning is necessary do so on germination, which should take place approximately seven days from sowing. The growing season is from late March to June, but this can be extended by a month or more at either end. For early sowings try raised beds and protect with cloches. Mid-summer sowings on the other hand, will benefit from semi-shaded conditions and a constant water supply. The radish is prey to few of the disorders of its brassica cousins, save flea beetle, which is usually merely unsightly rather than fatal to the developing plant. In truth, with just a little care and attention, the radish will tolerate most conditions.